The Wells in Woking programme was the brain child of three long-term Horsell residents: Tony Kremer, Peter Beck and Ann Harrington. In 2013, they approached the Council with an ambitious list of ideas to celebrate the life of H.G. Wells, who had lived in Woking and written some of his most successful works during that time. The Council was keen to support the celebration and work began to bring a programme of special events to Woking during 2016 to mark the anniversary of Wells’ birth. Wells’ move to Woking in 1895 inspired some of his greatest works, including The War of the Worlds. Wells made Woking infamous in the late 19th century, by choosing Horsell Common as the location for his imagined Martian invasion. To celebrate the Borough’s exciting connection with the author, the Council and its partners delivered the ‘Wells in Woking’ cultural events programme, which ran throughout 2016. The celebrations began in March, with two of Wells’ great grandsons launching the programme, and concluded on 21 September, which would have been his 150th birthday. 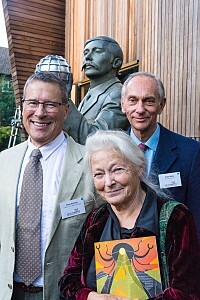 The special day was marked with a bronze statue of the writer, created by artist Wesley H Harland, being unveiled in The Lightbox gallery’s courtyard. More than 20 members of the Wells family travelled from locations worldwide for the occasion. A Wells in Woking Association has been formed and they are planning to host an annual event on the 21 September. If you would like to join the association, please click here. Party in the Park: Woking's biggest and best outdoor party for the community was themed in honour of the Borough's beloved author, and pulled in an estimated 20,000 visitors to help celebrate his life and works. See gallery for some great memories of the event. Even local brewer, The Crown, got involved in the celebrations and brewed the ‘Horsell Invader’ ale for this special anniversary.